Hell is not a place where we'll be eating, drinking and partying with our friends. In Matthew 13:42, Jesus describes hell: "...and will throw them into the furnace of fire; in that place there will be weeping and gnashing of teeth." And he said, "Then I beg you, father, that you send him to my father's house--for I have five brothers--in order that he may warn them, so they will not also come to this place of torment.'" Some say there is no such place as hell. But the Bible makes it clear that hell is real, and some of us are heading to hell. Revelation 20:15 says, "And if anyone's name was not found written in the book of life, he was thrown into the lake of fire." Some say that God is too loving to send anyone to hell. In Matthew 25:41, Jesus says: "Then He will also say to those on His left, 'Depart from me, accursed ones, into the eternal fire which has been prepared for the devil and his angels.'" "Those on His left" is referring to judgment day when all the nations [everyone who has ever lived] will be gathered before Jesus. He will then judge us, separating those who trust Him for their salvation from those who do not. Those trusting Jesus will be placed on His right. Those who have rejected Jesus will be placed on his left and then be cast into the eternal fire. God demonstrated His love by punishing His Son in our place. There is no greater love. God gives us His love by making salvation freely available to everyone. If you end up in hell it is because that is what you chose. You know the options. Trust Jesus as having paid the penalty for your sin [disobeying God] or on your own pay the penalty you owe for your crimes against God [hell]. Hell is where there is burning wind. It is like a fiery oven with flames of fiery judgment. It is filled with an unquenchable fire. It is eternal. It never ends. There is no relief. There is no comfort. There is no hope. There is eternal darkness and death. It is a fiery pit of eternal and just punishment in a lake of fire. Forever. Alone. That is what hell is like. It's your choice. Which do you choose? 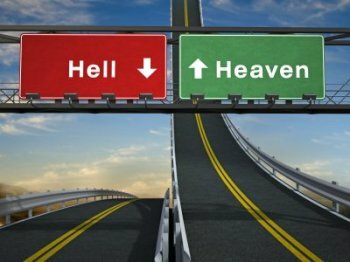 Life through Jesus Christ, or death and eternal hell?